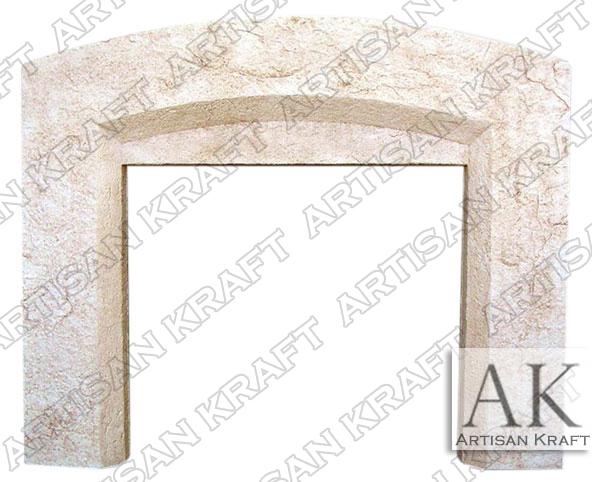 Beveled Arch cast stone fireplace mantel. A simple modern design that is very popular right now. This is pictured made from a cast stone like material but we can make it from marble, limestone and travertine. An option for anyone looking for a simple modern surround for an affordable price. Having this made from a white marble or a black marble will give this contemporary design an even more modern feel. The stylistic elements of this design are simply perfect. This modern fireplace can be made bigger or smaller due to its design. Typical Dimensions: 63″ wide x 55″ high *can be made to order.